We are a group of CI users and those who are working toward CI implantation. We meet over coffee and cake to discuss all things CI and much more. All brands of CI users and candidates are welcome plus a friend. The event is free to attendees with refreshments included. Joining instructions will be issued strictly on a first come first served basis.Please note our emphasis is on social topics and we are not a replacement for healthcare professionals. This voluntary group is setup to support cochlear implant (CI) candidates and users across Oxfordshire, Hertfordshire, Bedfordshire, Buckinghamshire, Berkshire, Birmingham and London. Meetings are held Oxford, London, Reading, Birmingham. Meetings this year will be held on 2 Feb, 10 Mar, 13 April, 8 June, 30 June, 10 Aug, 29 Sept, 19 Oct, 9 Nov and 7 Dec. The socials are informal and friendly with people that understand about hearing loss and the challenges it presents in everyday life. Venues will have minimal background noise to aid better hearing and also close to transport links e.g. train and bus stations plus car parking. 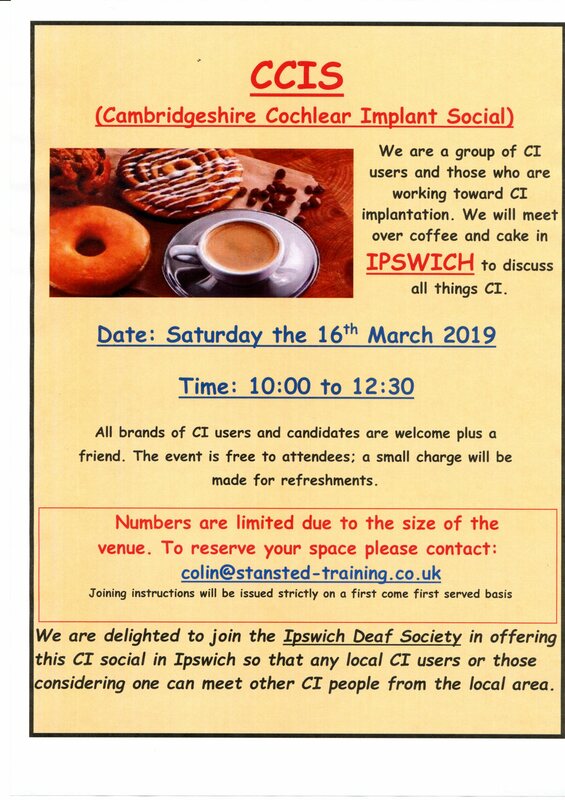 Partners, parents of CI children and friends of CI users or candidates are very welcome as well as people with a wide variety of backgrounds – whether you are born deaf, late deafened, sign, don’t sign or a bit of both. Our next Social Event is at at 1pm at the West Beach Bar & Kitchen, Lower Kings Road, Brighton, BN1 2LN. Bar area reserved, food and drink available to buy. Come along and join us, meet new friends and share experiences! Socials are usually 1:30pm to 4:30pm; venue information is confirmed a few weeks before each event. All CI users, candidates, friends and family are welcome to attend. These are a great opportunity to meet new people, share experiences, and/or ask questions about cochlear implants. Penderels Oak, High Holborn, Holborn, WC1V 7HP . This is a Wetherspoon Pub. new people interested in joining have the opportunity to meet in a more informal setting. These events are dedicated to socialising and any other issues, problems or information can be shared. We will be at the Duke 92, 18-25 Castle Street, Manchester, M3 4LZ. For further information on see here. Monthly meetings are held at 3 venues in Rotherham, Sheffield and Worksop. An Early Autumn Party in Islip Village Hall. 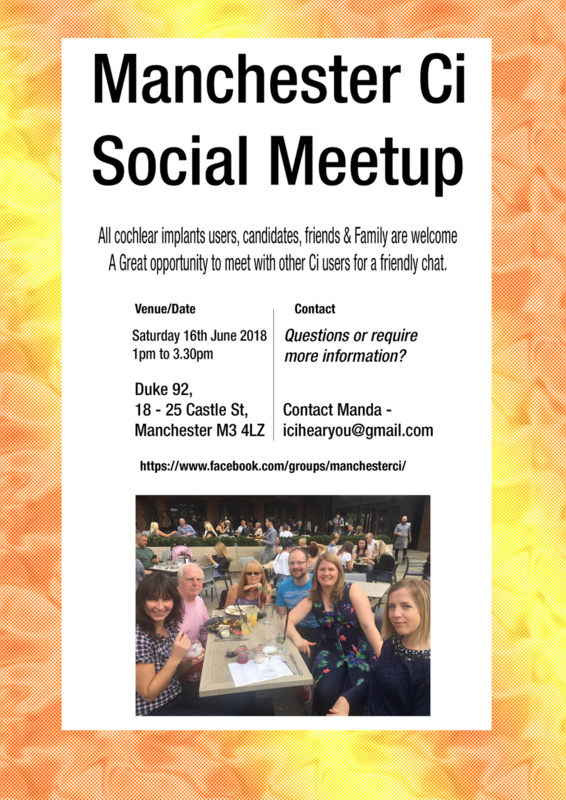 We are a newly formed Sheffield Cochlear Implant Users Group under the umbrella of Sheffield Central Deaf Club, Victoria Hall, 2nd Floor, 41, Chapel Walk, Sheffield S1 2JB. We meet every Friday from 11am till 1pm for informal chats. Bradford: 2 & 3 July 2019, 14 & 15 October– all at 10.00 to 16.00 – By invitation only. Contact YAIS for details . Telephone Talk at Bradford – by invitation only. An information day for families, adults and professionals to learn more about Audiological Processing Disorder (APD). We are excited to welcome a panel of experts including Dr. Doris, Bamiou, Dr. Nicci Chapman and Dr.Chrysa Spyridakou. Develop a deeper insight into APD including the diagnostic process, treatments and therapies. Take away and share practical tips and strategies to employ in everyday life. £25 per person, £40 per family (up to two adults) and £40 for professionals. To book your place on any of our sessions listed above or for more information please e-mail: info@earfoundation.org.uk or call: 0115 9421 985. Information mornings: SOCIAL MORNINGS: Last Wednesday of the month; 10.30am-midday (with the exception of the Christmas social and fuddle in December which will fall on Wednesday 18th December due to Christmas holidays). This monthly meeting provides an informal, social opportunity to meet with others and bring along family and friends. Ear Foundation staff will be on hand if you have any questions. (@The Ear Foundation) £1.50 per person- refreshments provided. Support sessions: TINNITUS SUPPORT GROUP: First Tuesday of the following months; Feb, Apr, Jun, Aug, Oct, Dec 1.15-3.15pm (@The Ear Foundation). The group is an informal, supportive group with a positive attitude towards enabling everyone to live well with their Tinnitus. We are not able to provide medical advice or comment on specific symptoms experienced by an individual. For information about the support group, phone 0115 942 7804 or text 07852 296613. £2 per person- refreshments provided. Support sessions: HEAR TO HELP HEARING AID MAINTENANCE CLINICS Drop in clinics for NHS hearing aid users in your local community across Nottingham and Nottinghamshire area.